Parental Lineage: From his father side the lineage (silsila-e-nasab) goes to Maula-e-Kainaat Hz Ali (KWK) & from his mother side it goes to Imamain-Kareemain Saiyaada-tun-Nisa Hz.Fatematuzzahra (R.A.).He was Alvi Syed from his patenal family and Rizvi Syed from the maternal side. His great grandfathers belonged to royal family of Bukhara (present day Uzbekistan).Among his greatgrandfathers Hz Shah Ayaat-ul-lah Alvi (R.A.) left the Sultanat and got settelled in Multan (Punjab province of present Pakistan).His grandson Hz Azmatullah Alvi (R.A.) came to Sirhind (Punjab,India),his Son Hz Hakeem Elahi Shah Muhammad Rahmat-ul-lah (RA) later came and settelled in Delhi.He was father of Hz. Niyaz-be-Niyaz (R.A.).He was appointed Kazi-ul-kuzzat (Chief Justice) in Delhi.He earned the title of "Hakim-e-Elahi". Hz Shah Niyaz-be-Niyaz (R.A.) got birth in Sirhind & came to Delhi with his father. His mother's Name was Bibi Ladoo but was famous by the name of Hz. 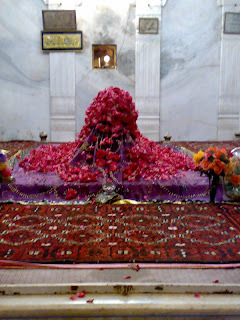 Bibi Garib Nawaz .She was daughter of Syed Maulana Sa'id Uddin,who traced his descent from Hazrat Imam Musa Raza (R.A.).He was a spritual caliph of Hazrat Sheikh Kalim-ul-lah (R.A.)of Shahjahanabad(Delhi).She was hereself a buzurg.Her Peer-o-Murshid Hz Shah Mohi-ud-din Diyasanami/Giyasnami (R.A.) inducted her twice in Silsila-e-Qadria, the reason for making her Mureed for the second time he told was that he was actually making the child in her womb (Hz Niyaz be Niyaz RA) his mureed. Education: His primary education started at home under guidence of his mother's father Hz Syed Maulana Sa'id Uddin.He got higher education from Madarsa Faqriya Delhi which was equivalent to a collage at that time.He completed his education including Quran,Hadis,Tafseer,Fiqh at the age of 15 .He was awarded the degree of Farighut-tahsil after 3 days of questioning by various scholars.He then became Ustad (teacher) their.He later became the principal of the Madarsa. Initiation in Sufi Order: Hz Shah Niyaz-be-Niyaz (R.A.) inherited spiritual qualities from his parents,particularly from his Mother from Childhood. His mother gave him in the care of Hz Sayed Faqruddin Muhammad Dehalvi (R.A.) who is famous by the name Maulana Faqr-e-paak/Fakr-e-Zahaan who later made Hz Shah Niyaz (R.A.) his spritual desciple.He used to call him Miyan.Hz. Faqr-e-paak deputed Hz Niyaz Be Niyaz to Bareli (Uttarpradesh,India) to carry out the work of silsila. Hz Niyaz be Niyaz RA was inducted in Qadri Silsila by Hz Abdullah Baghdadi (R.A.),who was direct descendent of Hz Gausul Aazam (R.A.).The incidence is such that one day Hz Fakre Paak(R.A.) told that in his dream Piran-e-Pir Hz Ghaus Paak (R.A.) has introduced him to a certain person (closely related to him) who would be sent to initiate Hz Niyaz-be-Niyaz (R.A.)as his desciple and Hz.Fakre Paak should have him accepted by the person.After six days Hz Fakre Paak (R.A.) told one day that Hz.Ghaus Paak (R.A.) has told him that the person has reached Delhi.Hazrat Fakre Paak placed a tray full of sweets on his head and holding the hand of Hz Niyaz-be-Niyaz (R.A.) went to Jama Masjid Delhi,where the person (Hz Abdullah Baghdadi RA) was staying.Hazrat Fakre Paak recognized Hz Abdullah Baghdadi at once and placed the tray infront of him.Hazrat Niyaz-be-niyaz was accepted by Hz Abdullah Baghdadi (R.A.) as his spritual desciple in front of huge crowd in the arch of Jama Masjid. Hazrat Shah Niyaz Ahmed (R.A.) also recieved spritual blessings from other saints of other sufi orders.In brief it can be put that he was initiated in Qadri order by Hz. Syed Abdullah Baghdadi (R.A.) and Hz Mohi-ud-din Diyasnami (R.A.),in Chisti-Nizami order by Hz Maulana Fakr-e-Jahaan(R.A.) and Hazrat Said-ud-din (R.A.),in Suharwardi order by Hz.Maulana Fakr-e-Jahaan(R.A.),and in Chisti-Sabri-Naqshbandi order from Hazrat Shah Rahmat-ul-lah. Marriage and Children:He was married with the daughter of Hz Abdullah Baghdadi (R.A.) who died after some year.He had two sons,Hz Shah Nizam-ud-din Husain (R.A.)and Shah Nasir-ud-din, from his second wife. Mazaar-e-aqdas: His tomb is in bareilly (Uttar pradesh,India) .His Urs is celebrated anually in traditional way which is attended by huge crowd. Khalifa (Caliphs):His elsest son Hazrat Shah Nizam-ud-din Hussain (R.A.) was his premier khalifa and sajjadanashin.He had lot of other caliphs,in which some prominent are-Syed Muhammed Sani of Badakshan,Maulvi Abdul Latif of Samarkand,Maulvi Nemat-ul-lah of Kabul,Maulvi Yar Muhammed of Kabul,Mulla jan Muhammed of Kabul,Maulana waz Muhammed of Badakshan,Maulvi Muhammed Husain of Mecca and Mirza Asad-ul-lah Beg of Bareilly. I want to know that younger son Hz Shah Nasir ud din (R.A.) of Qibla O Kaba Hz Shah Niyaz Be Niyaz was not the Caliphs (Khalifa)? as you have not shown his name in the list of caliph.Plz let me know. Sorry for the wrong information passed on to you due to confusion.Hazrat Shah Naseeruddin Miyan R.A. was a khalifa of his elder brother Sarkaar Taajul Aulia Hazrat Shah Nizamuddin Hussain R.A.
Assalamuwalaikum.. I want to take baiyyat into Nayazi silsila..Kindly guide me on this. I am from Bangalore. Can somebody give me the details of mazar e shareef location in bareily u.p.